There is no other film quite like Playtime. 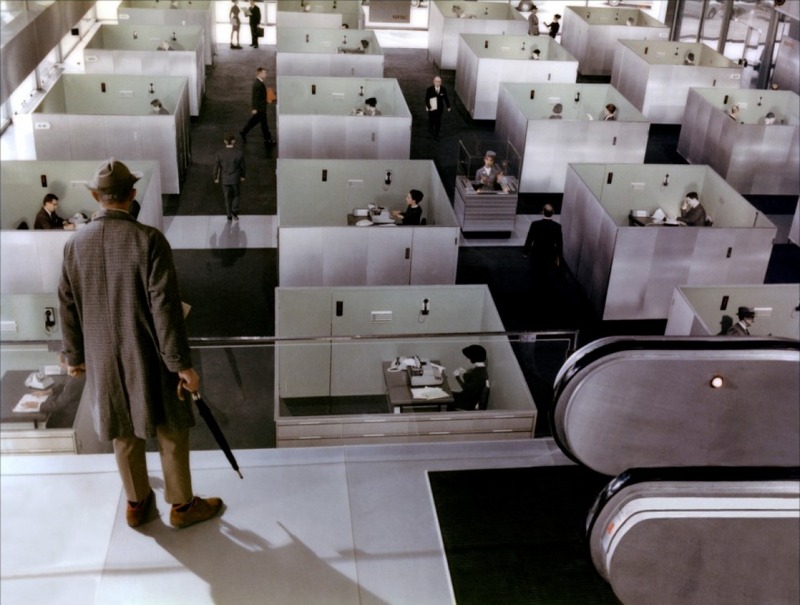 Directed and thoroughly conceived by Jacques Tati, the film is a comedic commentary on modernity, one that very likely extends from Tati’s unique reaction to the excess and dehumanization of daily life under the advance of technology. At the time of its release in 1967, Playtime was the most expensive French film ever made. For it, Tati created a huge set at the outskirts of Paris fondly referred to by locals as “Tativille”. His city within a city was representative of the purest ideals of the International Style of architecture. Buildings were made out of perfectly smooth surfaces like glass and steel, where the line between the private and public realm was often blurred. Buildings were rectilinear, describing pure straight lines, leaving no space for singularity, uniqueness nor superfluousness. Everything was made with a purpose. Decoration and ornamentation were deemed unnecessary and unrepresentative of function. Though life was already hectic and professionally oriented, there was hardly any space for chaos or for the unexpected. In its purest and most relentless, modernity for the International Style of architecture was in direct opposition to the organic, malleable, responsive and expressive character of human existence. Playtime could be described as an observational film, without much of a plot or dialogue. When people speak, it is usually an unintelligible hosh-posh that often mixes several languages at once, and that is almost always drowned by the constant murmur of modernity, which is represented by traffic, the hissing sound of electricity or by music. Though there are instances in which one character is singled out, the camera often brings a group of people into one shot to give the impression that, in the modern world, there is not a single minute of absolute tranquility, privacy, pause or silence. The closest thing to a central character is Monsieur Hulot, a tall and clumsy middle aged man who probably stumbled out of the Paris conceived in the Haussmann Plan under Napoleon III, into the city without personality made out of glass and steel. 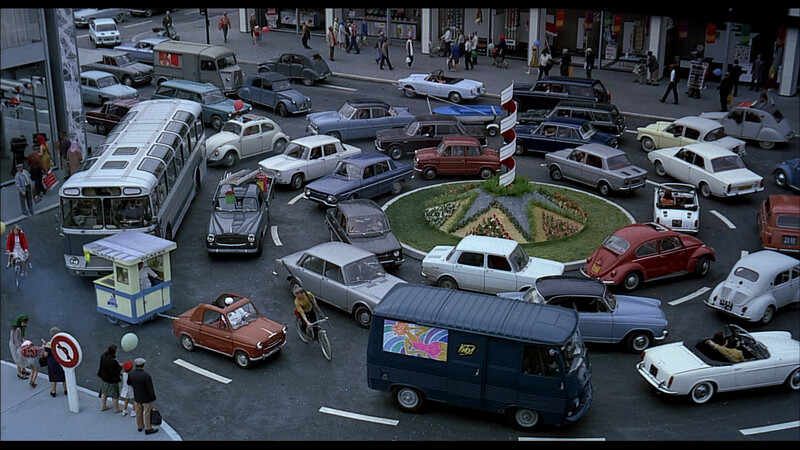 Hulot appears to be an extension of Tati, the vehicle through which he expresses his dizzying relationship with modernity, one in which he is often second best and playing catch-up. Playtime is a comedy because of its insistence to find hilarity in the nonsensical, in the superfluousness of technology and in the dehumanizing value of an architecture that leaves no space for individuality. Most of the comedy is physically delivered in a manner that is clearly influenced by the work of Chaplin and Buster Keaton. In almost the same measure, Tati literally plays with his set and his characters (hence the name Playtime), leaving them to their own accord, and challenging them to behave like humans in a space that does not quite fit the behavior of the human species. As the film progresses, so does the controlled chaos of modernity. Slowly but surely, the unpredictability of life begins to render the modern spaces obsolete. This is why in the second act of the film Tati shows us the impending deterioration of a fancy restaurant in which the owner, the staff, the architect and several construction workers work hard to keep up appearances, trying to maintain an illusion of control and discipline without much success. Architecturally, Playtime is fascinating. giving us a clear albeit exaggerated idea of what the ideals of the International Style might translate into. Though it is hard to deny the beauty inherent to the rigor and discipline of modern masterpieces like Mies van der Rohe’s Seagram Building, SOM’s Lever House, or Gio Ponti’s Pirelli Building; it is an entirely harder task to embrace the extension of those principles into a grander expression. Even though cities gained richness and diversity with the advent of the modern skyscraper, it is hard to imagine a city exclusively populated by these to be in any way welcoming, charming or enjoyable to be in. Where Playtime fails is on loving itself a bit too much. The film runs for 2 hours and 35 minutes, some of it being spent on observing the same joke or visual trick over and over again until the wonder and the laughter is almost entirely dried out. 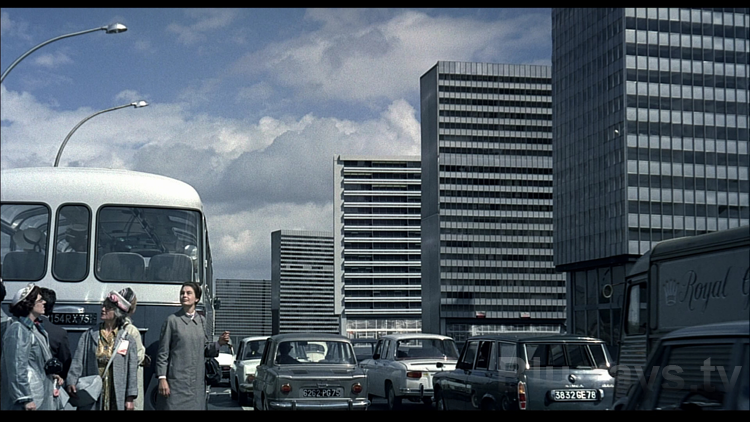 I feel a little ashamed I’ve never watched a Jacques Tati film. I hope to put that right this year. Hadn’t considered the architecture perspective in Playtime, I’ll keep that in mind for when I watch. Also have Mon Oncle on my list, which seems to also be among Tati’s most acclaimed. Great look at this one, Niels. Did you happen to catch this at the Music Box during the 70mm festival? I wanted to catch a screening of this and Vertigo but sadly missed both. Yes, I watched this at the Music Box during the 70mm festival. I also would have loved to catch a screening of Vertigo but I sadly couldn’t. It was a visual treat to watch this film and I really appreciated its very peculiar nearly silent comedic style. Completely recommend it.